Chancellor of the Exchequer Philip Hammond recently said public sector workers like nurses were overpaid, according to a Cabinet leak. 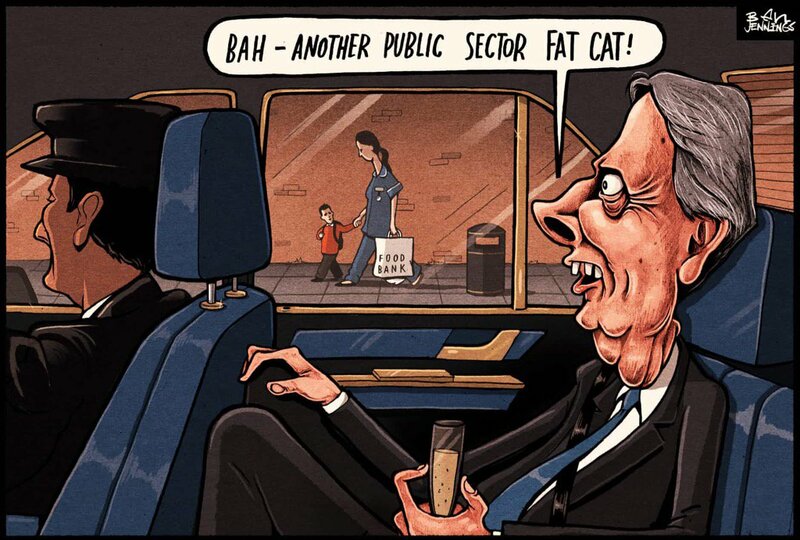 Perhaps he also sees the imposition of a £150,000 car parking fine as a triumph for private enterprise [Image: Ben Jennings]. No doubt Philip Hammond thinks a £150,000 fine is no big deal for a nurse – what with public sector salaries being so far ahead of the private sector. Right, Spreadsheet Phil? This particular nurse – along with other medical staff at University Hospital of Wales in Cardiff – has been ordered to pay a huge amount of money to a private car parking firm that has failed to provide enough spaces for staff at the hospital. Didn’t anything seem fishy about that, to the judge examining the case? Isn’t it a rigged system? Staff have to attend their place of work, and must park somewhere. If the car park managing company doesn’t provide enough spaces, they end up parking in places set out for members of the public – and incur a fine. It seems like a perfect scam, to This Writer. Add in two more elements: Firstly, the fact that parking at the hospital will become free next year, in line with the Welsh Government’s 2008 announcement that all hospital car parking charges would be scrapped. Secondly, the fact that a new deal was forged between Cardiff and Vale Health Board and Indigo Park Services, which runs the car park, in April 2016, making it possible for the company to take staff to court over unpaid parking tickets. Previously they were legally unenforceable. Put all those elements together and there seems a definite method to this meanness. Despite Mr Hammond’s alleged beliefs, staff at the hospital don’t have the money to pay the fines and a crowdfunding bid has been set up to help them. A nurse says she is facing a bill of about £150,000 in charges to a private company for parking at the hospital where she works. The unnamed nurse is just one of 75 members of staff at the University Hospital of Wales in Cardiff who lost a court battle against Indigo Park Services, which manages car parks on the site. The doctors and nurses have been ordered to pay an initial £39,000 in outstanding parking charges and £26,000 in court costs after a judge at the civil justice court ruled they must pay £128 per ticket. Indigo brought the case against the NHS staff who parked in visitor parking while at work because there is not enough space for them all to use the allocated staff parking. Cardiff and Vale Hospital Trust issues more than 8,500 car parking permits to staff but there are about 1,800 employee parking spaces on the entire site – meaning there is not enough space. damo, please, don’t demean vampires! I suppose this is another example of outsourced privatisation taking advantage of a captive audience. In this particular case it is not clear if this bandit Health Trust was on one of those incentive privatisations where they flog off their car parks for an upfront large lump sum and for a 20 year contract that sum would have been substantial. However no matter how substantial a sum those self same alleged leaders of this Trust must have known all about the free parking mandate that was nearly upon them and immediately closed down the contract conversation….or maybe in this case fast tracked their agreement on the deal rubbing their hands and their windfall. If these Health Trust managers knowingly fast tracked this deal they need to attend their own hospital to have their heads examined, or better still resign asap..
You can’t shame the shameless! No parking then the staff should turn around and go home! Then the hospital management would have to act! Play hard ball with these aholes! Looks like Indigo is a French multinational outfit. In other words we’re faced by a company with deep legal pockets that’s greedy for profits at any cost. Remind you of a certain British outsourcer whose moniker begins with a “C”? Greedy private company pigs. Don’t get me wrong, private companies can be very good in some ways. But when they get a monopoly, they vastly take advantage of it. Selling monopolies was one of the things that got Charles the First into trouble. I have read dome very unsympathetic letters, in the Metro, regarding this and am astounded. Do these people not understand the consequences of these nurses not getting to work on time? I’m sure that these are the same people who shouted down the junior doctors, when they went on strike. What I don’t understand – perhaps, you can verify this, Mike – is why the land was private and not hospital land. unless, of course, like at Stoke Mandeville Hospital, much of it has been sold off by the stupid Tories! Why is a private firm carrying out these duties and not hospital employees? On what planet was the judge? I’m sure that people would have had something to say, had lives been lost, as a result of these nurses not being able to get to work on time, or at all. Since when did we become such an intolerant society? What happened to compassion? Empathy? Understanding? Community? Human decency? Have all of these been sold? now, it seems, we have to pander to the whims of individuals, for fear of being labelled a bigot yet when it comes to shared responsibility, this is a dirty concept. It is all about ME. We, us…? No. They and them are not my concern.